Onu Bay is a 5 bedroom Executive House on the western sunset side of Rarotonga. The house is perfect for a family holiday or to share with friends - a home away from home. Onu Bay offers plenty to enjoy your holiday in paradise. The house is set back in a garden just 40 metres (approx) from a beautiful white sandy beach where the swimming is safe and snorkelling is easy. This two storey house with 2 bathrooms has generous living inside and out. A fully functional and open plan kitchen means you can prepare meals in the company of others. Or talk a walk and enjoy local restaurant offerings. Read a book on the verandah, or have cocktails down at the lagoon, which is just a short stroll down a quiet sealed accessway beside the house to the beach. Everything is close when you stay in Rarotonga. Walk, bike, bus, scooter or car—there are plenty of places to go and things to see and do. Come and stay at our place and experience it all for yourself! •has a bakery right across the road. •located adjacent to the Sunset Resort and Albertos Restaurant. There are special conditions around holding special events at Onu Bay (not suitable for large weddings / marquees). Prior approval must be sought with maximum numbers allowed. Further information provided on inquiry. There are two dining areas that seat 10 people. One inside the house, and the second is on the covered verandah. Two kayaks are provided complimentary. Two recreational bikes are provided complimentary. A complimentary range of snorkels, fins and masks are provided. Tennis courts are less than 1 km away. The closest golf course is only 1.2kms away. Two sets of complimentary golf clubs are provided. Onu Bay Holiday House - A great place to stay. We enjoyed our time in Rarotonga and this was complimented by the great accommodation. The location is excellent, being close to the airport, bakery, restaurants and beach. The property is well appointed and very clean, with a lot of things that you would not expect. The air-con in the bedrooms worked incredibly well, and is a must if you want a good night sleep. The layout means there are a number of areas to relax in, both inside and out, with good air flow. We used the pool almost every day. The perfect way to watch the sun go down. I would thoroughly recommend this property. Thanks very much for choosing to stay with us. You and your group were great and we were pleased to read that you enjoyed it at Onu Bay. Thanks for leaving the place so nice and tidy too. The food and drink parcel you left behind were all gratefully received by the locals. We hope that we are able to see you again! The property was great, with a good layout inside. It was well equipped with gear which we could use and also aircon and the pool were necessities in the heat! We were all very impressed with the location as well. The owner does live on the property, he was friendly and gave us good advice on activities we could do. They are very strict with the 10.30pm no noise policy, so I would only not recommend if you are intending on staying up for a few drinks past this time. Thank you for taking the time to provide your feedback on your recent stay at our house. We are delighted to hear you thought we had a beautiful and well equipped home, and enjoyed the outside pool and aircon. We take great pride in being able to supply everything that our guests might possibly need in the house while on holiday. The bonus of being next door to Sunset Resort is that our guests have easy access to Anchorage Restaurant and Bar and in return we have an agreement that both properties have reduced noise levels from 10:30pm so we do ask our guests to be respectful of our neighbours by reducing outdoor noise levels to quiet conversations or to move inside the house and close the doors. Our house is very suitable for couples and families who want to have a nice relaxing holiday in Rarotonga but doesn’t suit groups who like to party loudly well into the night and early hours of the morning. Location was fantastic and the house immaculate. Fantastic house, well presented and has everything you could possibly need for your holiday. We absolutely loved this property!!! We booked this as a family and loved the size of the house, and how we could each have our own space, as well as having the privacy of our own pool and backyard. The property is well presented, and was super clean and tidy, as well as being in a great location - right near the beach! The house had all the amenities you could ever want, and we would highly recommend this to all!! We booked this house as a family group (3 generations) and it exceeded all of our expectations. The house is positioned beautifully, is absolutely stunning and had all the amenities we needed, and then some - there was nothing missing! We loved the privacy of the house and pool area and easy access to the beach. Having kayaks and bikes for our use added to our wonderful experience and we highly recommend this property. 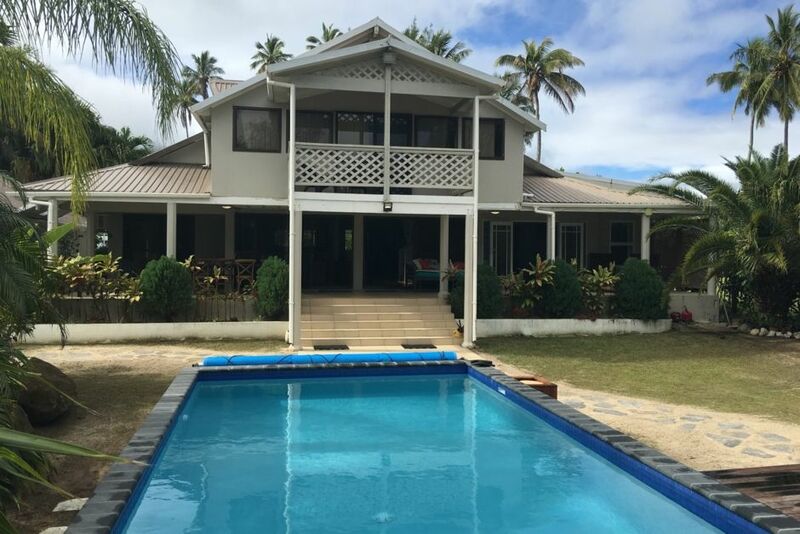 Onu Bay is a spacious 5 bedroom executive house on the western sunset side of Rarotonga. The house is perfect to share with family or friends; it’s truly a home away from home where you can have a wonderful holiday getaway.